Apparently when I’m really worried about things I cope by making .gifs now. In all seriousness, my grandfather had a stroke this morning and we haven’t gotten too much good news yet (recovery takes a long time), so I’ve been watching clips of these two to keep me stable. They’re miraculous that way. 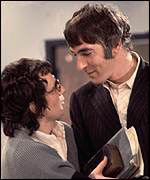 Peter and Dudley in 1973. Photo courtesy of Corbis Images. I was going through some of my comedy research and reread an article by Peter Cook’s biographer, the biologically unrelated William Cook, on Bedazzled, Peter’s most successful film appearance by far. 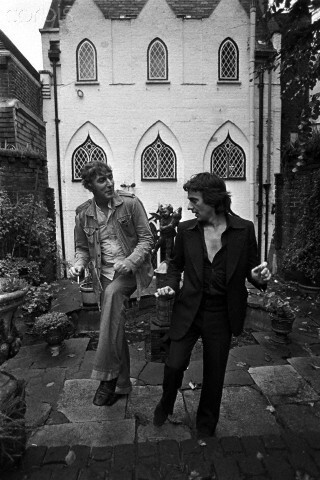 It got me thinking – the article highlights, amongst other things, why Peter Cook and Dudley Moore succeeded as a double act until the balance between the two of them began to go off-kilter, and I decided that now is as good a time as any to write about the two of them. 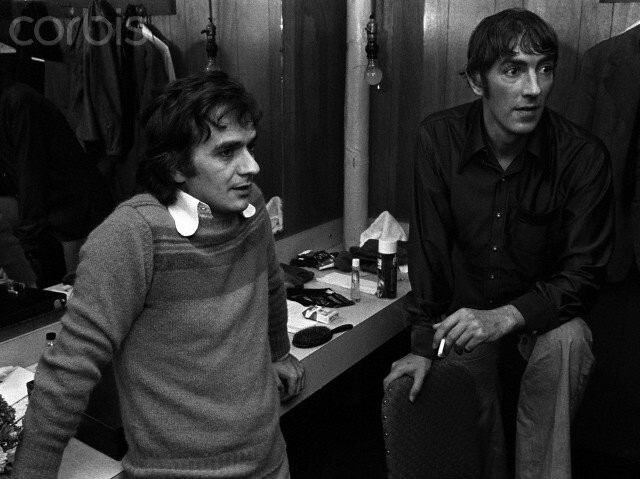 Peter Cook and Dudley Moore mean a lot to me, as anyone who’s charted the development of my this-will-never-be-finished novel Londinium knows. I used their comedic rapport as the basis for the main characters that I write for, and I can pretty much confirm that they were the double act that made me realize I loved double acts and had loved them for a long time beforehand without knowing it. They also taught me a thing or two about how a double act has to have the perfect balance between the two performers to work well. Let’s start with a little background: Peter and Dudley were brought together by Beyond the Fringe. They’d never worked together prior to that. Peter was a tall, upper middle class fellow from Torquay, a seaside paradise in Devon, whilst all 5’2″ of Dudley hailed from Dagenham, a working class suburb of London. Peter found himself at Cambridge, and Dudley was a Magdalen College Organ Scholar at Oxford. Through the work of John Bassett (a jazz musician whose group Dud played piano for), they were brought together with two other performers, Alan Bennett (of Oxford) and Dr. Jonathan Miller (of Cambridge), and Beyond the Fringe was born. To make a long story short, Peter and Dudley clicked and ended up working together after their BTF days were over – Dud was offered a show by the BBC, and to make sure things went smoothly he invited Peter to be a guest on episode one. Peter stayed. Peter and Dudley in 1976. Photo courtesy of Corbis Images. The show known as Not Only…But Also (and which I frequently shorthand as NOBA) was a smashing success even as the satire boom caused by Beyond the Fringe in the early 1960s was settling back down – namely because Peter and Dudley were just funny no matter what they were doing. Peter was a fantastic wordsmith, and something about him often seemed to be otherworldly when he went into monologue-delivering mode. Dudley, who did less of the writing unless it was writing music, was the superior actor – indeed, it was his acting skills that made him stand out to the BBC during Beyond the Fringe and prompted them to offer him a television show. It was such a big part of NOBA’s appeal that nowadays Peter and Dudley are the quote on the TV Tropes page for corpsing. The article I mentioned at the beginning of this post pegs Bedazzled (1967) as the moment that everything began to fall apart. And to be fair, that’s a somewhat accurate assessment. The film was directed by Stanley Donen, who gave both performers ample room to breathe and be themselves, and it works brilliantly – it’s a great film and I regularly list it amongst my favorites. (All of my favorite films are comedies, which should shock nobody given that I write this blog.) What William Cook asserts is true, though – Peter does, in fact, feel somewhat distant, and Dudley provides the warmth (and the soundtrack, which I listen to frequently). It’s again Dudley’s rapport with the audience that carries the film – he makes charmingly adorable facial expressions, shows emotions ranging from confusion to frustration, and, in the end, breaks off and goes his own way instead of relying on Peter (playing George Spiggott a.k.a. Satan) to help him win the woman of his dreams at the cost of his soul. It’s that ending that always gets to me. This movie, at least to me, is a mirror of their relationship behind the scenes – Peter uses his mastery of the English language to keep Dudley under his control (he did the bulk of the writing in their partnership and more frequently went out of his way to corpse Dudley), but in the end, Dud ends up rejecting him and going on alone. And in real life, that’s what happened. Peter slowly declined into alcoholism, so Dudley ended up with more writing influence (as well as a job as a sort of babysitter when they were on tour). They began recording Derek and Clive in the 1970s (which is a bizarre story itself), but when you watch the filming of the third album, released as a sort of documentary called Derek and Clive Get the Horn, you can see the relationship has completely shifted. By this time, Dudley was having considerable success in Hollywood, and Peter actually took out his frustrations verbally during the recording. Dudley actually walked out on Peter and didn’t show up for the third day, and the double act was more or less over. They reconciled later in life and occasionally got together for interviews and one-off performances and the like, but their careers went separate ways after that. That, amongst other things, tells me that there was an underlying affection there – the two of them were genuinely great friends, and it shows – even though their friendship shifted into a love-hate relationship during the tough years in the 1970s. The double act never officially ‘broke up,’ but they went their separate ways career-wise and reconciled their relationship after things were stable for both of them. They remained associates and became friends again later on. When Peter died, Dudley called his answering machine to hear his voice for the next three weeks or so as a coping method. They genuinely did like each other an awful lot, and the fact that they managed to reconcile and get back on good terms with one another later on is a testament to that. After all, there’s no point in being in a comedy marriage with somebody that you flat-out hate.